Official opening of our school extension. promotes the formation of the pupils in the Catholic Faith. Plans are underway for big celebrations at Scoil Naomh Erc in 2013. The school was originally opened in 1963, with Tiershanahan amalgamating in 1968. To mark this milestone a booklet of stories, information, pictures and other items of nostalgic interest to past and present pupils will be produced. A committee has been formed of members from the Board Of Management, Staff and Parents Association to coordinate plans which will culminate with the launch of the booklet and a big day of reunion and celebration in the school on 2nd June 2013. Our booklet has now gone to the printers. Thanks to all who contributed to the contents and everyone who sent in pictures. Any items and pictures not in the book will become part of a display of memorabilia and slideshows on June 2nd. The focus of the committee has now switched from the booklet to events of the day itself. The provisional itinerary for the day (subject to change) is to include a Prayer Service of celebration and thanksgiving beginning at 2.30pm, followed by the Booklet launch. Refreshments will then be available for children and adults alike as well as some entertainment provided by local musicians. Visitors can then browse through the school interior, where various displays of memorabilia and slideshows of photographs should bring back some memories to both young and not so young. A host of fun activities are also being planned for the school sportsfield, such as tug of war, penalty shootout, bouncy castles for the younger children and much more. Keep your diary free for June 2nd and join us for what is sure to be a great day for all. 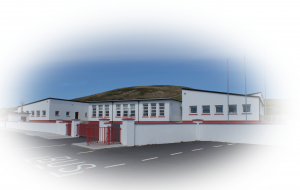 For the walking enthusiasts there will be a guided walk around the school locality on the Saturday (June 1st) beginning at the Ballyheigue Castle gates. The walk will make its way through Maulin and Triskmore mountains along by the back of Glenderry School, overlooking Loop Head Co. Clare to the North and from Ballyheigue Bay to Mt. Brandon to the South. The walk will begin at 2.30pm. Part one of our two day 50th Anniversary Gathering took place today in what was a glorious sunny afternoon. It was a guided walk starting at the school, then east along Glenderry with a left turn taking us up through Ballylongane road to Maulin. Our first port of call was at the water reservoir where we had a short break to sample the breathtaking view and take in the fresh heather smell. A full panoramic view can be seen from Ballyheigue Bay right around to loop head in Clare and back up the Shannon. The next stage of our trip, which was superbly led by our guide for the day, local historian and writer Bryan Macmahon, took us along the crest of Triskmore Mountain, exiting at Tiduff on a road locally known as “Castle Street”. Bryan explained how he had recently discovered the source of this name, dating back to the time of the Martello Towers. Apparently the tower located on Kerryhead was designed similarly to a castle construction and the road was built especially to access the tower. This road as a result has since been called “Castle Street”. From here we headed south to tiduff cross and then east through Glenderry, passing above Keel which nestles in a cul de sac beside the sea. Keel has the remains of an ancient church and graveyard, the graveyard still being in use by the local Corridon Family. Continuing east along Glenderry we had a very nostalgic stop at the Old Glenderry School, now a holiday home, where some great memories were brough to life for some of our group who had attended the school in the early sixties. To the new owners credit, some of the materials and furniture of the old classrooms have been retained as they were all those years ago and it made for a very interesting visit indeed. Following the short walk between the old and new schools our journey ended at the Scoil Naomh Erc car park, with all agreeing the trip had been a wonderful and enlightening experience for all who took part. The big day has come and gone, and what a day it was. Tremendous success with a huge crowd gathered in brilliant sunshine. How well the children performed on the day, they were a credit to parents and teachers alike. The prayer service led by Fr. Leane PP was both dignified and entertaining with the children performing several musical pieces and many of the pupils from times passed involved in the bringing of various symbolic gifts during the service. A group of local musicians, most with children or grand children in the school, provided some wonderful traditional Irish music during the service. One of the highlights was a special fashion show by some of the school children depicting typical school attire during the 60’s, 70’s, 80’s, 90’s and 00’s. 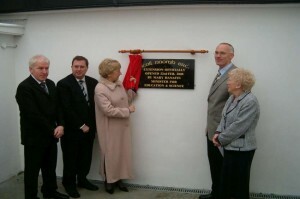 There was also the unveiling of a plaque in memory of past pupils and teachers who have gone to their eternal reward. Dr. Edmond Harty launched the school’s new Golden Jubilee Book which was produced to commemorate the occasion and was selling like hot cakes during the course of the afternoon. Following the customary speeches, the assembled crowd dispersed to the various locations of interest and entertainment throughout the school, school grounds and in the marquee which was set up for the occasion. Food and musical entertainment were provided in the marquee, children were spoiled for choice with face painting , tug of war, soccer, bouncy castles, disco corner with DJ Shane, nail bar and lots of snacks and soft drinks. Inside the school were various points of interest with the 60’s style classroom setup in the Senior Infants room drawing huge interest as a trip down memory lane for so many of the older visitors. There was a display of roll books and historical writings in the school hall which attracted great interest as past pupils endeavored to locate their names, those of their class mates and family members. Throughout the school classrooms a slideshow on the whiteboards displayed photographs, some of which were kindly handed in to the school over the past six months from the families of the community with the remainder from the schools own collection of photos taken over the past 10 to 12 years. The very large attendance really enjoyed the day and and all were in agreement that the whole event was very well organised and carried out. Great credit is due to all involved in organising this great day and a special thanks to all the locals who helped out over the last few days with parking , stewarding etc. This day of celebration will long be remembered by all. See pictured from the day in Gallery/Golden Jubilee.